1. Wash and soak rice for 10 minutes. Cook vigorously in 12 to 15 cups of boiling water, to which little salt and little oil is added. 2. Drain water and allow to cool completely. Cut all the vegetables into fine even sized cubes. Cut spring onion tops into 1/2 inch pieces. 3. Heat oil in a large frying pan. Add ground masala and fry for a minute. Stir in onions, carrots, capsicums and cabbage in the order given. Fry in a high flame with ajinomoto. When vegetables are tender add salt, onion tops and pepper. Fry for a minute. Mix other sauces and rice. Fry well in high flame for few minutes. Serve steaming hot. 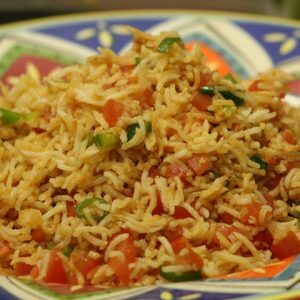 Feel free to comment or share your thoughts on this Szechwan Fried Rice Recipe from Awesome Cuisine.